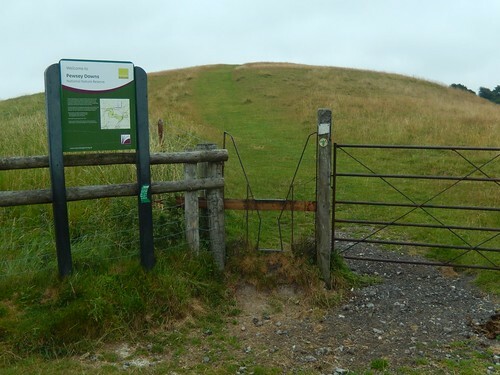 This was my second catch-up walk in the series, which I would go on to walk alone because the original date on the calendar clashed with this year’s Mendip Challenge event. 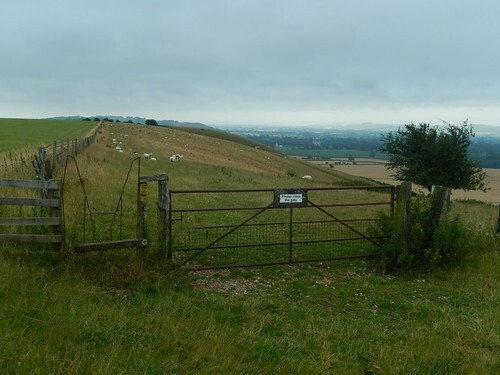 It was to start at a free car park at Pewsey Downs, a few miles south of Avebury in Wiltshire. Forecast to be around eighteen miles in length. 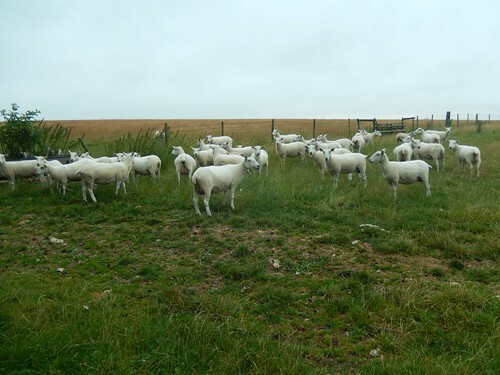 Is this common for this part of Wiltshire? People looking to escape the expanding town of Swindon? What had I missed?! 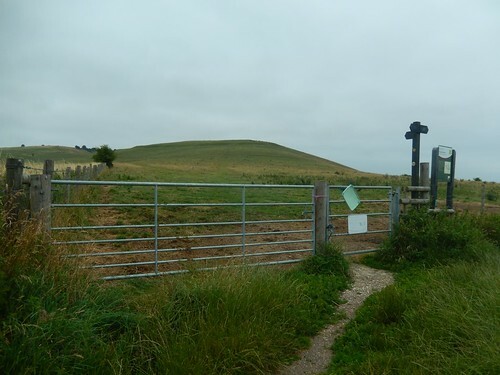 From a bridleway running through the car park, I began climbing up and around Knap Hill; avoiding the cow-consumed summit and site of a former Neolithic Camp. 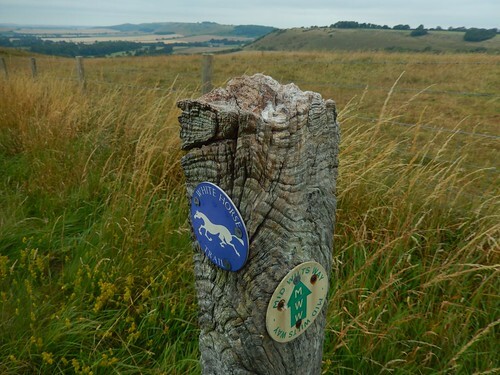 Not only was I following the White Horse Trail, I was also walking the Mid Wilts Way. 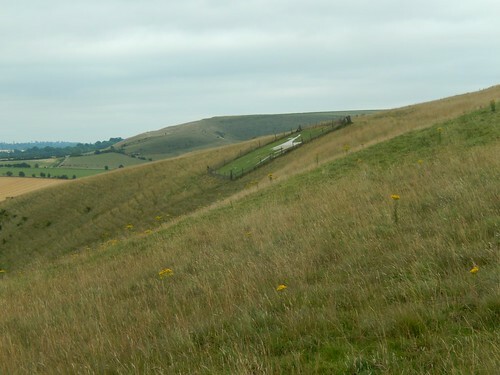 For the first few miles of this walk, it was downland. 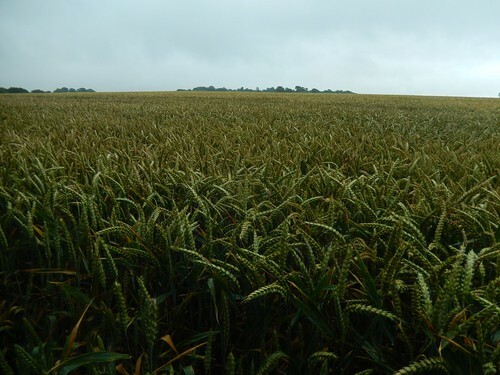 Following a ridge with uninterrupted views overlooking the plains to the south. 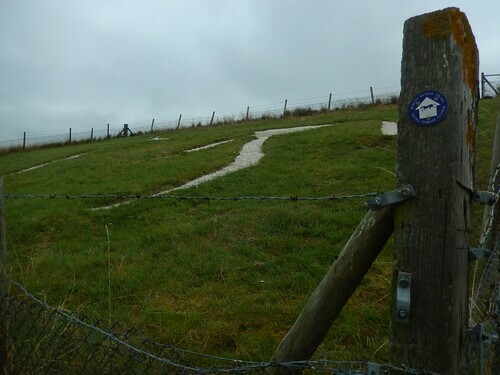 A great feature of any walk, where so much of the White Horse Trail has seen us clambering over “flexible” stiles and along overgrown paths where the vegetation can almost tickle your nose. I found it quite easy to follow the path and navigate the trail so far. But, just beyond Gopher Wood, I reached a state of hesitation with a myriad of directions to choose from; both on the ground and on paper. 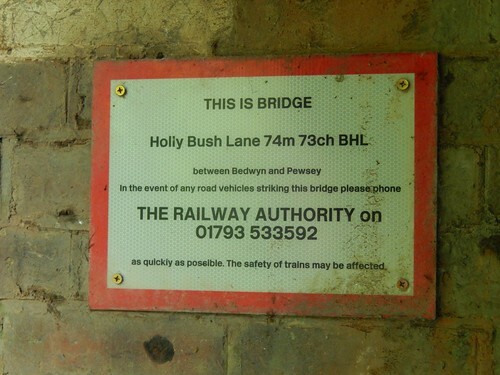 I did find the waymarking, here to be a bit unreliable and possibly misleading. 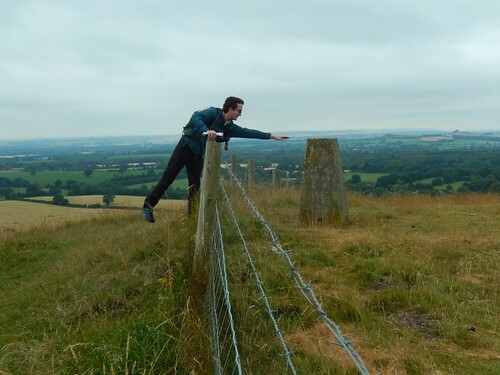 For me, it was a case of trusting in my ability to read and follow a map, which paid off in the end; even as I continued through kissing gates with no waymaring whatsoever. 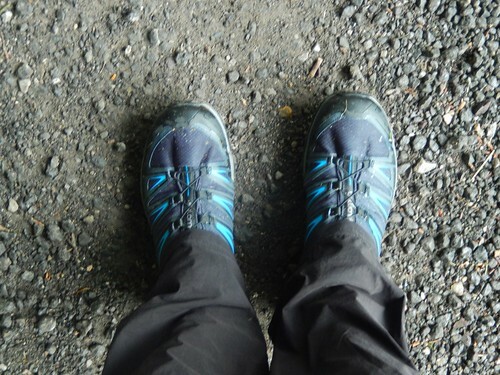 This walk was my first outing for a brand-new pair of walking footwear – my second purchase of the year! These are the Salomon X Ultra 3 GTX walking shoes, sold exclusively by Cotswold Outdoor at the time of purchase. I’ve still yet to write a more detailed analysis on these but, to summarise briefly; I’m generally preferring these to boots with ankle support, at this time of year. 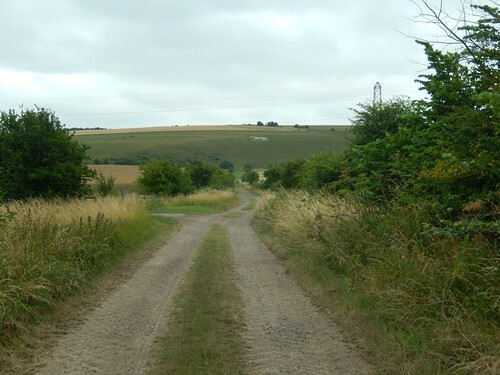 A dark, gravelly track soon led me to the A345, which I crossed to begin gently climbing around Oare Hill (most of which, remains to be private land). 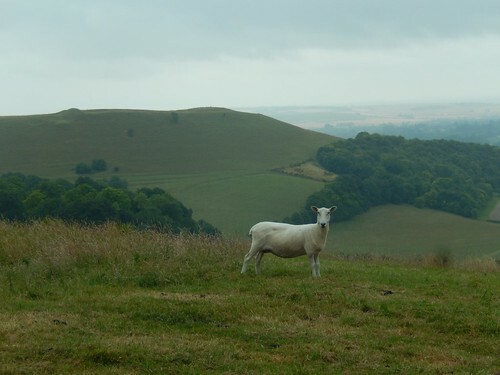 Beyond this sheep, you can see the rise of Giant’s Grave (an ancient settlement) and perhaps make out the trig point on top. This was my next intended destination. 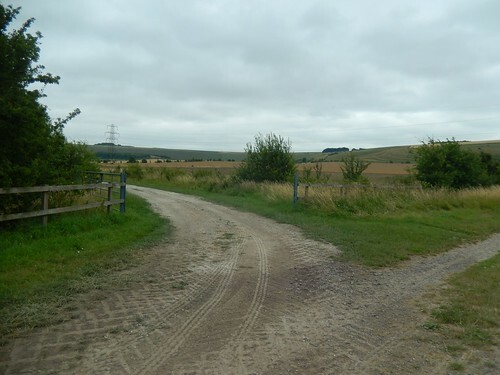 There are alternative paths available, even though they add to the mileage and, I’ve since realised that I could’ve potentially bagged a second trig of the day… Instead, I turned west along what looked like a path (but, apparently wasn’t) and I was en route to where I wanted to be. 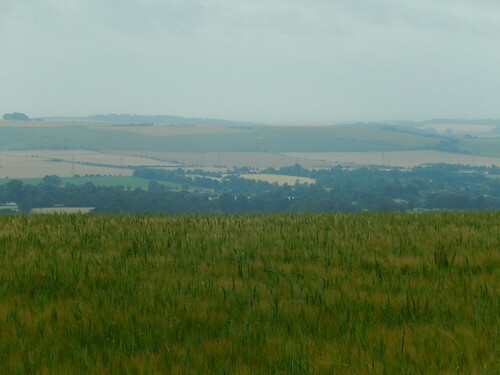 South from here, I could just make out the Pewsey White Horse on its hillside. My next destination after bagging the imminent trig. It seemed so far away. 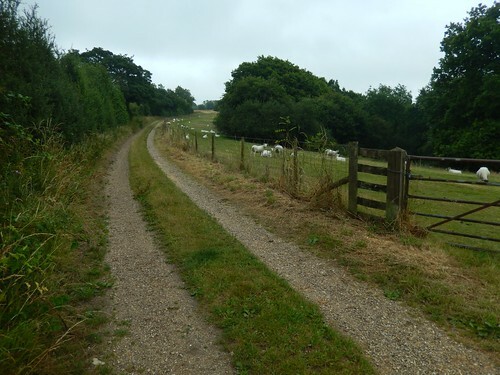 Still following a combination of the Mid Wilts Way and White Horse Trail, I would pass the first ‘other people’ I had seen all morning (beyond the ‘overnight car park’). A certain sign that I was heading the right way. Regardless, I had to bag it! You never know when you may or may not return. There was also a kitemark nearby although, I’ve yet to determine its significance and my memory of GCSE geography is vague. This was immediately followed by a steep descent bypassing the village of Oare. 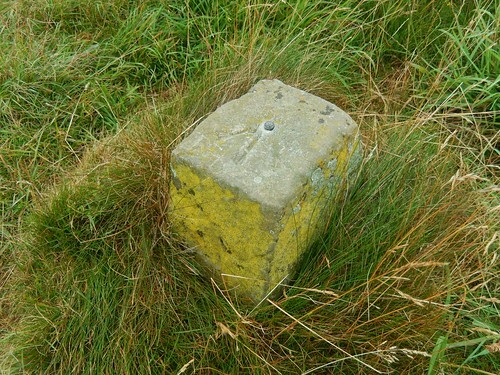 I noticed a lady who was ahead of me had immediately turned back up the hill but on the wrong side of the fence (it’s not open access land)… Was she determined to lay her hands on the stone pillar, I wonder? 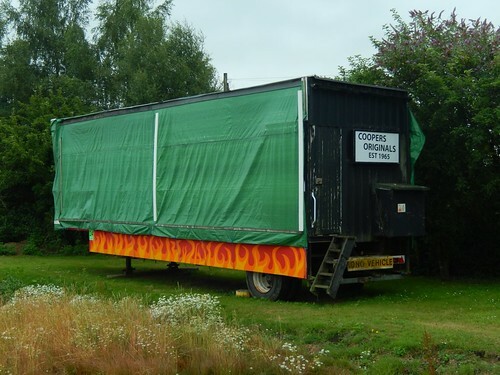 Coopers Originals appears to be a local carnival group. 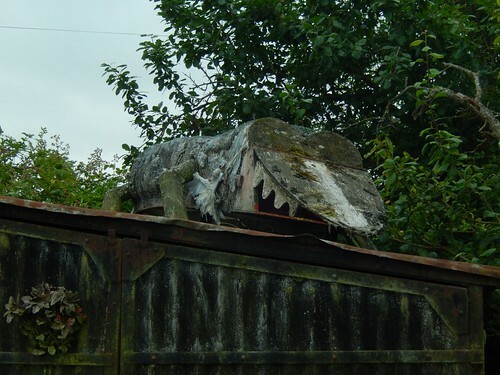 Nobody about, but for the crocodile lurking from overheard – certainly, a more threatening specimen than the one more recently discovered at Chew Valley Lake! 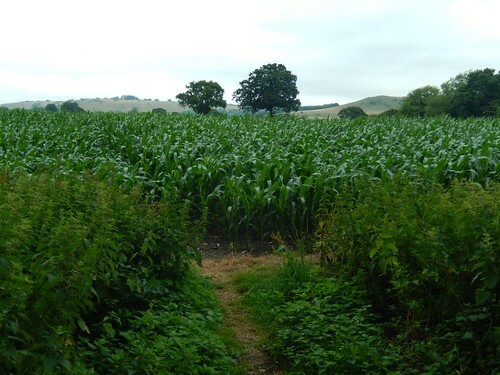 Over a quiet road and two fields of towering crops were waiting… Through this first field, I could walk quite comfortably, with almost enough room for two to walk side-by-side. In the next, however, it was a case of keeping my eyes peeled to the ground with my arms up in order to protect my face! 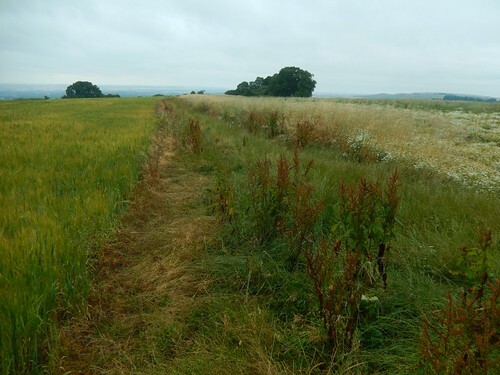 How can two neighbouring fields differ so much?! 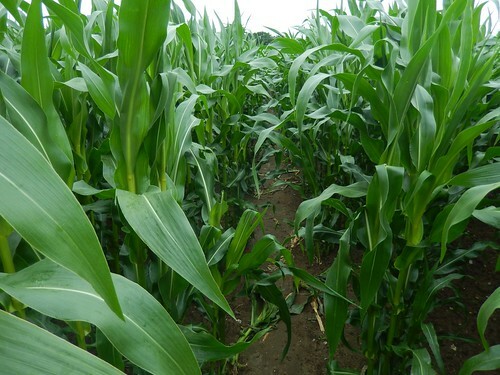 Is each owned by a different farmer? This was taken from the other side, looking back at what I had overcome. Up ahead, I would cross over the Avon and Kennett Canal. 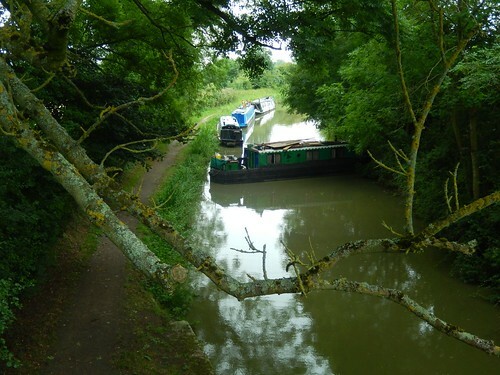 There was no noise or motion coming from this narrowboat… Was it turning very slowly or, had the owners forgotten to tie it down when mooring the night before? I read it almost like broken English and yet, the majority of signs I’ve seen are precisely like this one. Quite recently, I’ve noticed I have three “THIS BRIDGE IS” signs available close to home but, each time I cross a river in my car, I have to slow down and check. 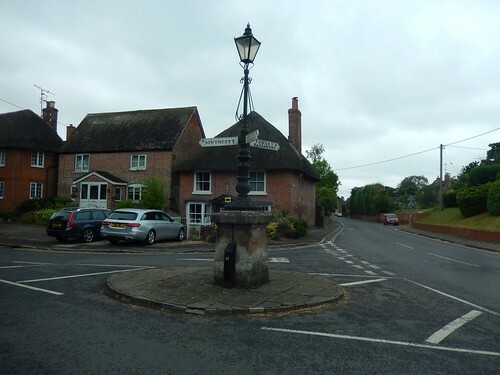 Further on and I’m walking through Pewsey itself. Albeit, away from the town centre. 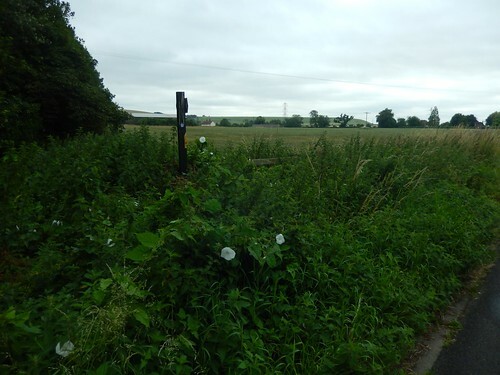 Beyond a housing estate with good waymarking, I arrived at the entrance to this field. Clear walking on the inside; lots of nettles stamp through on the outside. Maybe this walk was going to remain more fortunate than the others. 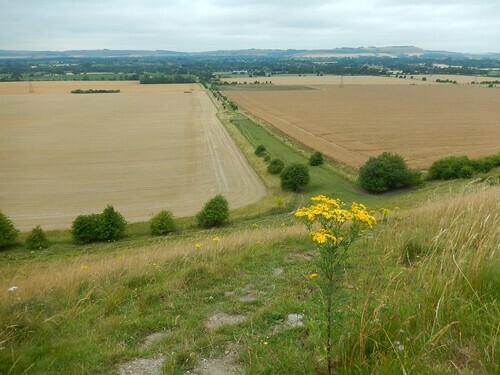 A track, Green Drove, would lead me straight towards downland bearing the Pewsey White Horse, at Pewsey Hill. 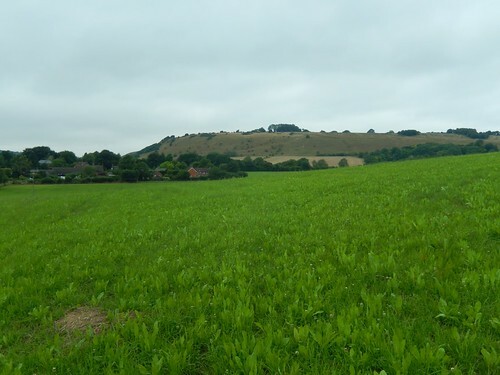 To the eastern end lies Fyfield Down. 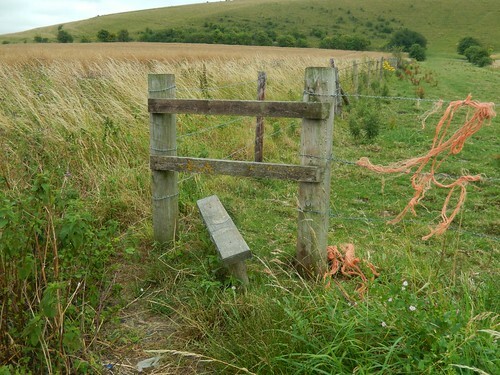 Following the overgrowth of earlier, I now had to negotiate what had been the most unfortunate stile of the day so far… In spite of its appearance, it did not move a millimetre as I climbed over. 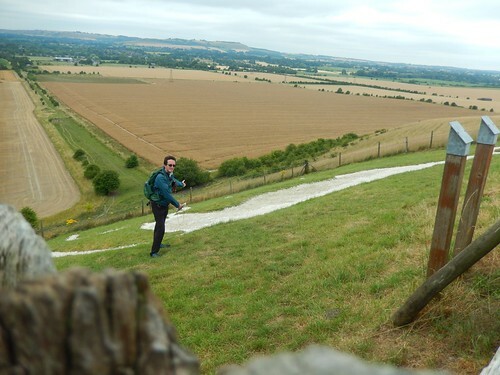 Climbing the obvious path up the hill, I find the White Horse Trail runs alongside the enclosure safeguarding the chalk horse figure. 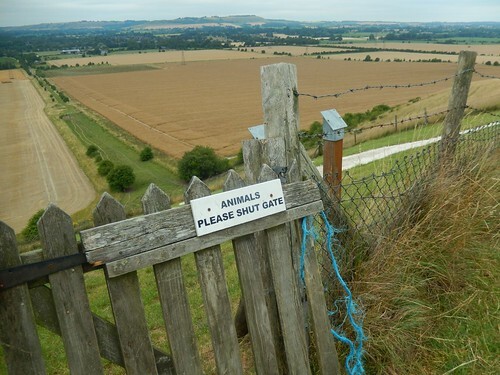 …They even provide signs for the animals to read. In case you can’t see it, I’ve tried to highlight the white horse for you. One last look, as I decide to end Part 1 of this walk; to be continued in my next post. 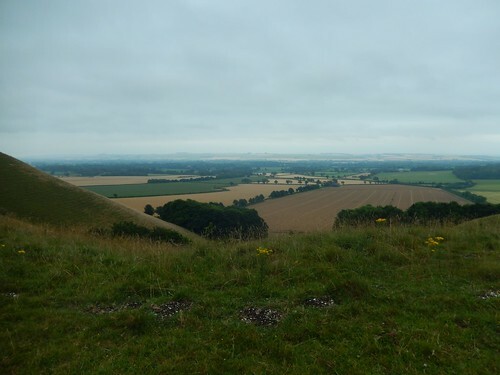 This entry was posted in White Horse Trail and tagged chalk figure, Giant's Grave, hiking, Mid Wilts Way, Oare Hill, Outdoor Bloggers, Pewsey, Pewsey Downs, Pewsey White Horse, Walking, White Horse, White Horse Trail, Wiltshire on 11/09/2017 by Olly Parry-Jones.